Paperweight made from palewa stone and hand-engraved onto the surface. 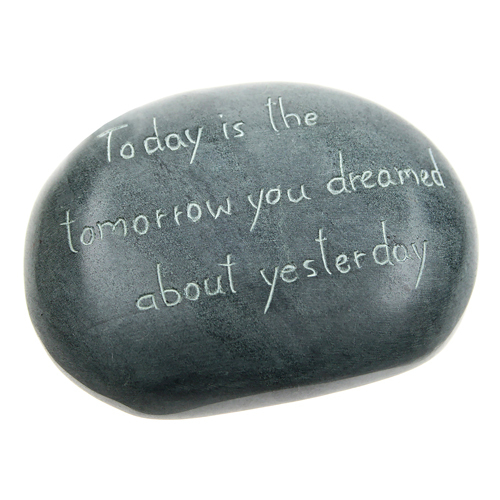 "Today is the tomorrow you dreamed about yesterday"
Our sentiment pebbles and paperweights are hand-made by specialist producer groups in Agra the hub of stone craftsmanship in India, Nairobi and Kenya. Palewa is a form of Indian soapstone which is a type of metamorphic rock. It is largely composed of the mineral talc, thus is rich in magnesium. It has been used throughout history for inlaid designs and sculptures. Some Native American tribes would use this stone to make bowls, cooking slabs and other objects; this was particularly common during the late Archaic archaeological period. Vikings also hewed this form of soapstone directly from the stone face, shaped it into cooking pots and sold these at home and also abroad. In modern times this form of soapstone has been used in India for centuries as a medium for carving. In Brazil, especially in Minas Gerais, due to the abundance of soapstone mines in that Brazilian state, local artisans still craft objects from this material. These handicrafts are commonly sold in street markets found in cities across the state. Some of the oldest towns, notably Congonhas, Tiradentes, and Ouro Preto, still have some of their streets paved with soapstone from colonial times. All of our sentiment pebbles and paperweights are lovingly hand-made and in purchasing these beautiful stones you are helping Shared Earth to help others!